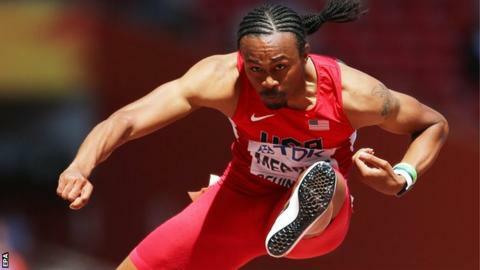 American hurdler Aries Merritt will have a kidney transplant following the World Championships. The Olympic champion and 110m world record holder, 30, has a rare genetic disorder and will receive a kidney from his sister on 1 September. Merritt ran 13.25 seconds to win his heat on Wednesday and qualify for Thursday's semi-finals in Beijing. The Chicago-born athlete said he "felt like a weight was lifted" after being able to share his plight with others. "After the Worlds, I'll focus on it," he added. "The more I train the worse my kidneys get and that's why I am getting a transplant." Merritt was diagnosed with the disease in 2013 and was told his athletics career might be over. "That I am here again running shows me that I'm a fighter and that I can overcome anything if I stay with a positive mind. "For this championships, I'm going to take it one race at a time." Merritt says it has been "difficult" competing with his health issues. "It hurts so much on the inside to know you are the best but you're struggling with this illness and you are just trying to fight through. "I love running, I love competing, this is my life and here I am." He remains hopeful he can defend his Olympic title in Rio next year. "I am here in Beijing for mental sanity more than anything," he said. "I don't want to be sitting in my house cooped up in bed waiting for surgery. "I'd rather be out enjoying life because, who knows, this could be my last championship if the surgery doesn't go well." New Zealand rugby union winger Jonah Lomu underwent a kidney transplant operation in 2004 after being diagnosed with a debilitating condition called nephrotic syndrome. Before the operation, Lomu struggled to walk more than a few yards. However, he subsequently returned to play club rugby with Cardiff Blues after two years on the sidelines. Lomu's new kidney was donated by New Zealand radio personality Grant Kereama, who said: "It's what you do for your mates". What happens to you after a kidney transplant? After a transplant, patients like Merritt begin treatment with immunosuppressants to prevent their bodies rejecting the new kidney. If patients have an organ from a living donor, in the way Merrit is receiving one from his sister, it will usually begin working immediately. However, the new kidney can sometimes take up to six weeks to start working properly and patients need dialysis during this time. Most people can leave hospital after about seven to 10 days and should be able to do normal activities within a few months.